Your business faces an array of unique logistics management and worker scheduling challenges every day. Accurate and agile operations are crucial, especially when you have a large, mobile workforce. Our logistics staff scheduling software aims to simplify the process of managing drivers and other logistics workers. We offer real-time schedule access, easy employee communication, and credentials management. With Shiftboard, you can attach instructions, location maps, and other details to shift assignments to keep your workforce informed. You can also dispatch proactively with real-time reports for labor, coverage, and routes. We help you troubleshoot issues and fill routes ASAP. With truck driver schedules, bus driver rosters, and warehouse worker schedules available via our employee scheduling app, your entire operation is accessible 24/7. From the warehouse to driver destinations, Shiftboard is there when you need it. Fill shifts online, quickly and accurately, with employee scheduling software for logistics. Let staff sign up, auto-schedule, or assign routes yourself. Instantly alert mobile staff of schedule changes and new available shifts 24/7. Track where drivers, delivery people, or other logistics workers clock in. Provide location maps to improve accountability. Monitor equipment and gain visibility into details like load volumes to protect assets. Move your workforce’s schedule online with logistics staff scheduling software. Whether you schedule bus drivers, delivery people, truck drivers, or people in other roles, scheduling tools will help. There won’t be a need for so many phone calls, spreadsheets, whiteboards, and post-it notes. Your on-the-go employees will appreciate our employee scheduling app, too. With Shiftboard, any scheduler can easily organize personnel and drivers across many routes, locations, and roles to manage workflows and find last minute subs ASAP. Save money with coverage charts and forecasts for overtime, under time, and time off. 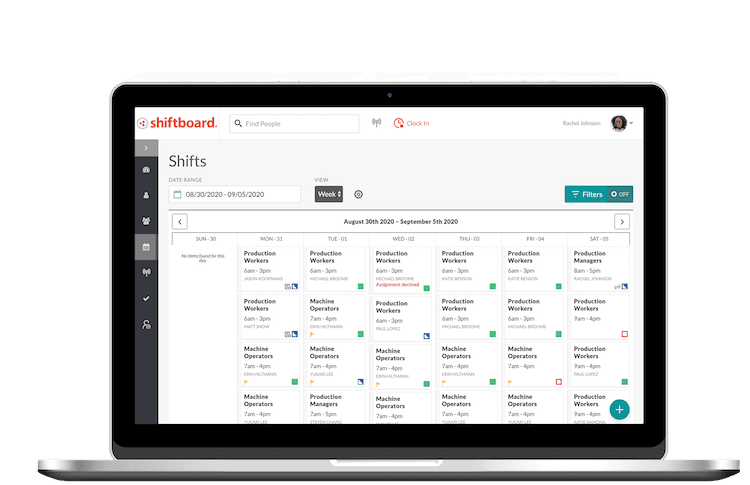 At Shiftboard, we have tailored our powerful workforce scheduling solution to the specific needs and workflows required to staff your drivers and personnel across different routes, locations, and roles. 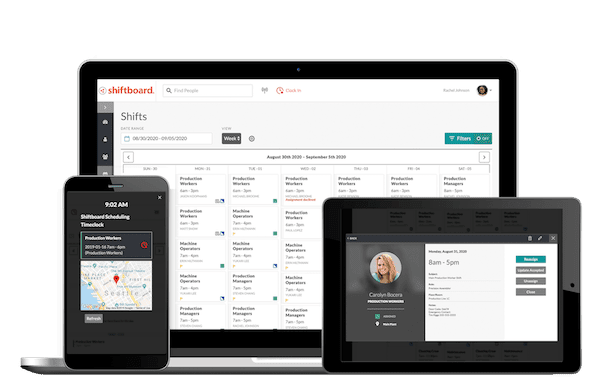 Shiftboard gives you the best way to fill shifts quickly, communicate with your mobile workforce, and help dispatchers and line managers with last-minute requests. Shiftboard includes an employee scheduling app that gives your drivers and personnel 24×7 access to their schedules, streamlines communications with your mobile workforce, and makes it easier for dispatchers and line managers accommodate ad-hoc requests. Easily view and manage your workforce requirements to confirm qualifications, licensing, and compliance with legal and labor regulations. Store all staff information in online profiles and set schedule guidelines to simplify compliance. Additionally, you can automatically account for factors like seniority, union status, certifications, and more. You can easily upload documents, set alerts for expiring licenses, and auto-assign driver schedules. Mobile employee coordination is simpler with online schedule access, real-time updates, and instant communication. Multiple locations are easier to manage, too. Always know exactly who’s working, when, and where. Automated shift alerts get the right people to the right place, on time, every time. Communicate instantly 24/7 via text. Shiftboard shows you who’s available and qualified, making it easier to fill shifts and get driver scheduling right.